docPrint Document Converter Professional which is also called as docPrint Pro is an expert in document converting. It is able to convert any printable documents to many kinds of image formats, such as the OpenOffice document of odt to wbmp. It allows you to complete the whole conversion process in several minutes and you can easily master the application. When you download docPrint Pro at http://www.verypdf.com/artprint/docprint_pro_setup.exe and install it on your computer, you will find there are three applications in docPrint Pro, which are designed for different purposes. In the installation directory, there are the GUI application and command line application. The GUI application can be used in batch conversion and the command line application is often used by many software developers. In the printer list, you can see there is a new added virtual printer named docPrint which is the third application in docPrint Pro. docPrint is not only a virtual printer which supports to scale page size to different number for saving paper and ink, it is also a good document converter which can print any printable documents to 50+ image formats. With a friendly interface, you can understand the conversion step in the following contents fast. The first step in the conversion from odt to wbmp is running docPrint. If docPrint has been set as the default printer on your computer, you should right click on the ODT document and choose the “Print” option, which can run docPrint directly. If docPrint is not the default printer, please open the ODT document and click “File”—“Print”, which can open the “Print” dialog box and you can choose “docPrint” as your printer in “Printer” combo box. Then please click on “Print” button. The second step is to opening the “Save As” dialog box. In this dialog box, you can see there are some buttons in the toolbar and also a small dialog box named as “Option Settings” on the right. Please don’t care about them if you want to convert odt to wbmp only. 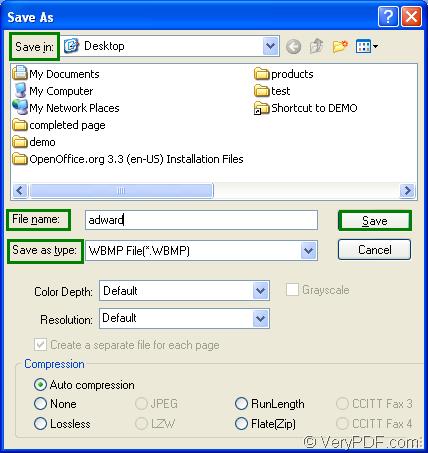 Just open the “Save As” dialog box by clicking “File”—“Save as” or clicking the “Save File” button in the toolbar. You can also use the hot key “Ctrl”+ “S”. 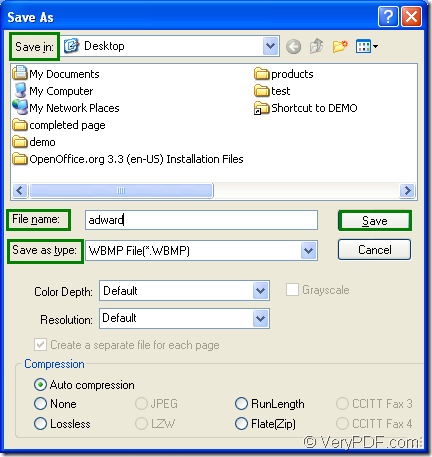 The last step is to save the target file in the “Save As” dialog box. Please see the “Save As” dialog box in Figure1. You will see some combo boxes and an edit box. Please choose the output location in “Save in” combo box, edit the name for the output file in “File name” edit box, select the output format in “Save as type” combo box and click on “Save” button. You will see a green progress bar at the bottom of docPrint main interface when you click on “Save” button and you will get your target file in the specified location when the progress bar disappear again. Then the conversion from odt to wbmp comes to the end. How to print OpenOffice documents of ODT to EPS file? How to convert documents of MS Office to jpg?